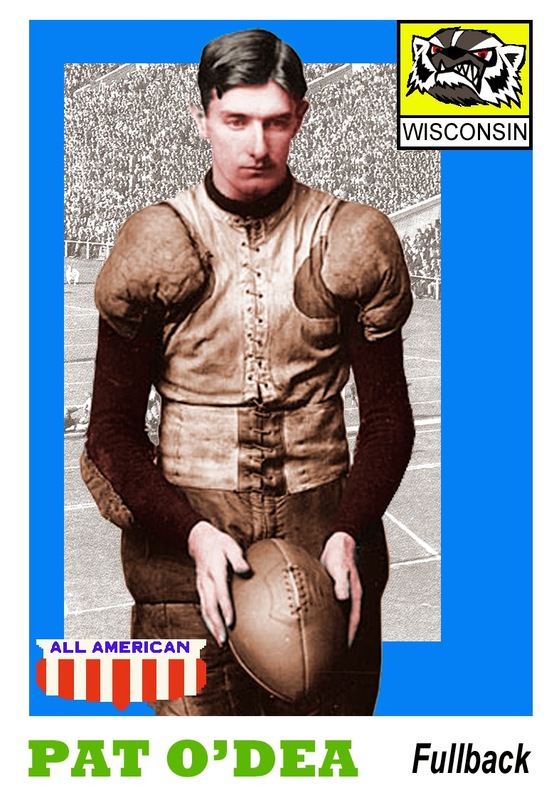 This suave, smooth-typewriting young man is Patrick John O'Dea (1872-1962), an Australian who was one of the first "superstars" of American football - a Wisconsin wizard and a record-breaker dubbed the "Kicking Kangaroo", twice selected in Walter Camp's Collier's Weekly All-American teams (1898-99), entered in the Helms Hall of Fame (1954) and, on his deathbed, inducted into the National Football Foundation's College Football Hall of Fame (1962). Incredibly, his NFF online inductee detail reads, "He was a star rugby player for Xavier College, Melbourne", which is as wrong as any detail can possibly get. Yet it's true that for four years at the end of the 19th Century, at the very time that college football was the biggest thing in a sports loving nation, and a field goal was worth as much as a touchdown (five points), Paddy O'Dea was the King of Madison, Wisconsin. 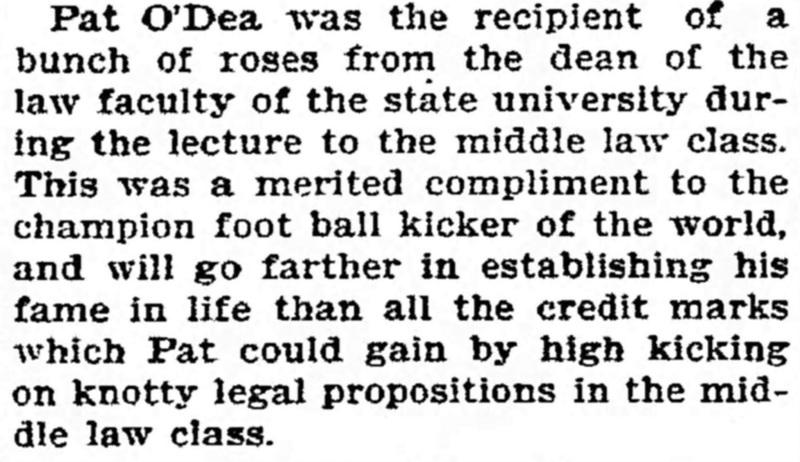 "[O'Dea] was the player who put the foot in football"
For all the accolades, however, the awful truth about O'Dea is that he was an inveterate liar with a lily-liver and a yellow streak, an embezzler and a lush and altogether an absolute rotter, a bounder and a cad. American newspapers occasionally offered hints of his bad temper and foul mouth, though "controversial" was the only mildly adverse label he carried across the country. But hey, he was a champion footballer, right? And Americans continued to hero-worship him for almost 80 years. Isn't that the way of life? 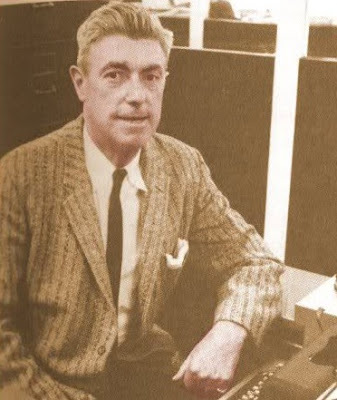 Also the greatest footballing fabricator of all-time! 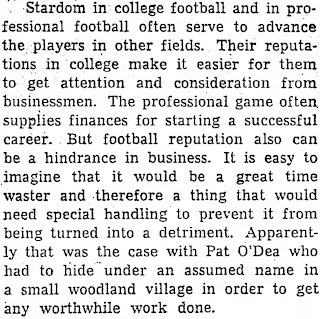 Even as late as 1955, Pulitzer Prize-winning sports writer Arthur John Daley (above at his Remington portable; 1904-74), in his "Sports of the Times" column in The New York Times, made outlandish claims on behalf of Paddy O'Dea, echoing O'Dea's own fairytale that at the age of 16 he had been chosen as an All-Australian halfback "for a form of football patterned after English rugby". There was no such thing as an All-Australian team in Australian football 1886, nor would there be one for another 61 years. 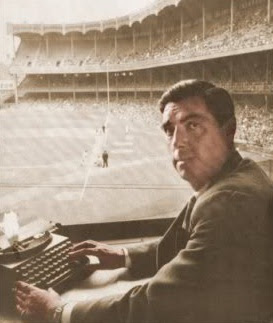 American Typospherians, especially those with little or no interest in sport, would have been astounded had they been watching Eastern Australian television news bulletins any time last Sunday, or reading Eastern Australian newspapers on Monday morning. Which news item dominated the bulletins and the papers? The European humanitarian crisis? The Prime Minister's reluctance to offer sanctuary to Syrian refugees? Australian plans to instead bomb Syria? Not on your Nellie! 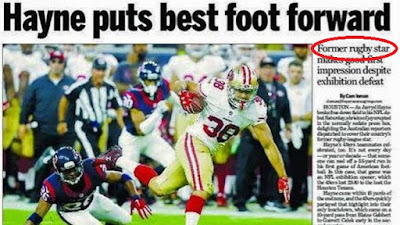 What our so-called journalists and network anchormen were getting their knickers in a twist about was the signing by the San Francisco 49ers National Football Conference team of an Australian "rugby star", Jarryd Hayne. 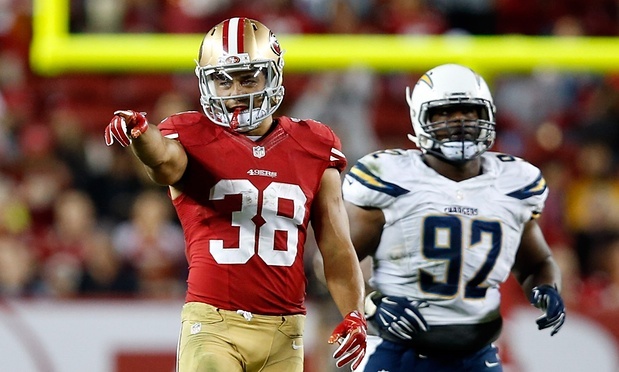 "Hayne Train makes Australian sports history" screamed the headlines. Was anyone in the US paying any attention to all this? Was an Australian making the cut in the 49ers 53-man squad newsworthy over there? Did anyone get anywhere near as excited about it as our media did? 1. 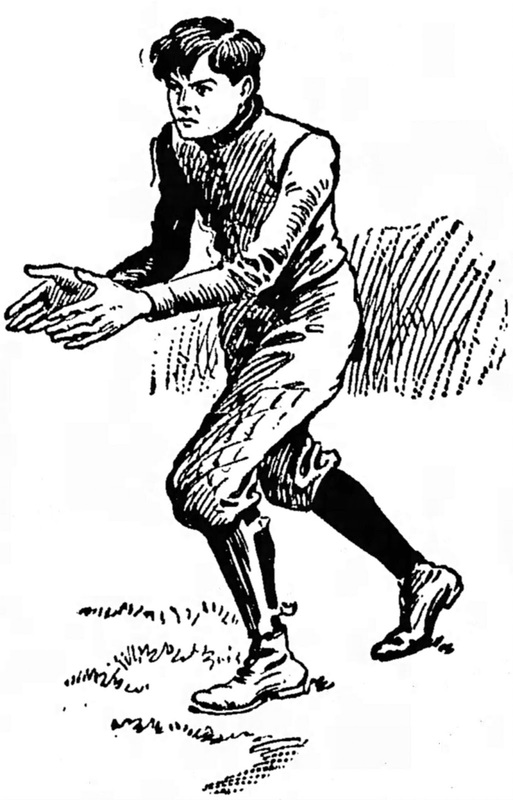 For the benefit of American readers of this blog, Hayne was an "Australian rugby star". But - the fact of the matter is that he was a large fish in a very small pool. In Australia, the word "rugby" usually refers to the true international code, rugby union; the other version, rugby league, is called "league". Hayne played rugby league, which is the major football code in just two Australian states, New South Wales and Queensland. Outside of Australia, it only has any sort of hold in parts of the North of England, one part of New Zealand and in Papua New Guinea. Internationally, by far the major rugby code is rugby union, which dominates in New Zealand and South Africa and is also played professionally in England, Wales, Scotland and Ireland, as well as in France, Italy, Argentina and Japan. 2. It's ironic, at least for anyone who knows anything about sports history, that this confusion in the United States about "Australian rugby stars" persists into the 21st century. 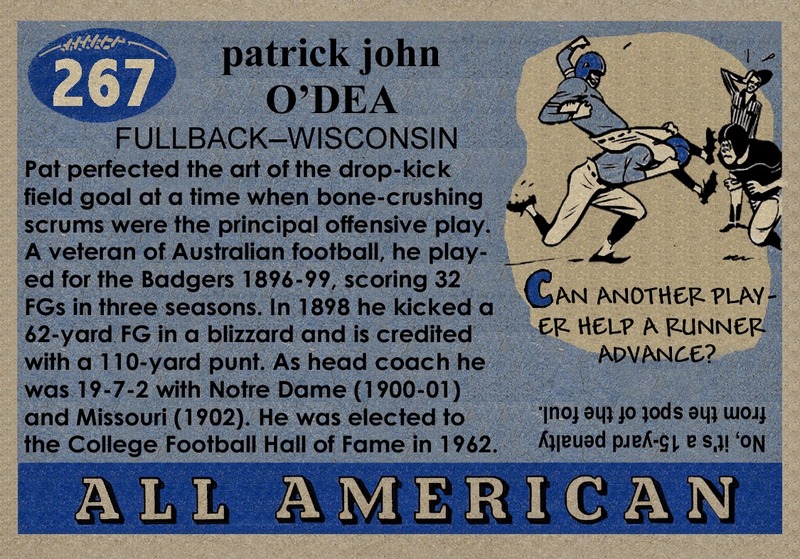 When Paddy O'Dea became the first Australian to "make it" in American football, he was often called an "Australian rugby star" - a line that was still being used about O'Dea right into the 1970s. 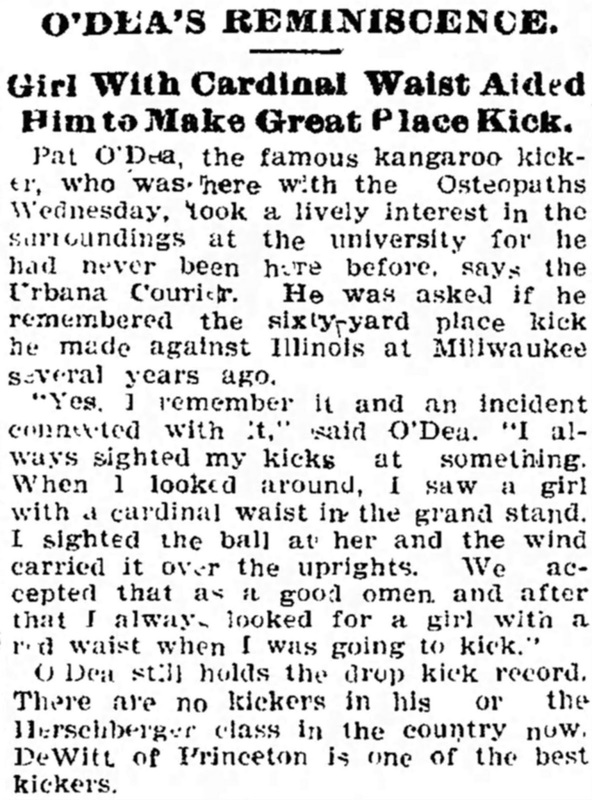 O'Dea never played rugby in Australia, of any kind. In his homeland, O'Dea played Australian football, which is as different again from rugby as American football is (though both the Australian and American codes were derived directly from the game played at Rugby School in Warwickshire in the first half of the 19th Century). 3. 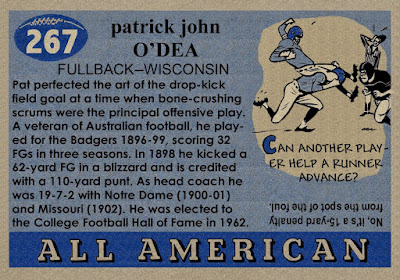 In some other ways, there are interesting comparisons to be made between Jarryd Hayne and Paddy O'Dea (O'Dea, by the way, was always called Pat O'Dea in the US, but in Australia he was known as Paddy O'Dea). 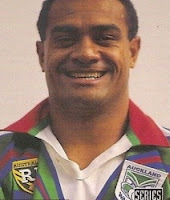 Hayne (right) is the son of a former rugby league professional of Fijian-descent, Manoa Thompson (left), but he was raised by his single mother, Jodie Hayne. 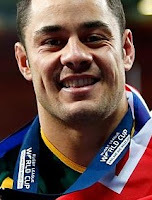 Jarryd was born in Sydney, on February 15, 1988, at a time when Manoa was playing for the South Sydney club. While Jarryd is especially close to his mother, naturally, he also appears to have developed a good relationship with his father. Indeed, there is no sign of any animosity between his parents. One thing Hayne has never been accused of is being free and easy with the truth. 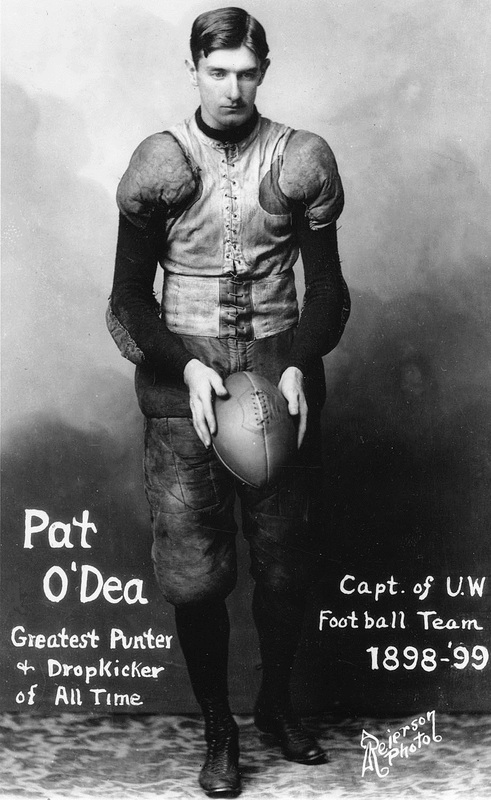 And that cannot be said of Paddy O'Dea. Here, published for the very first time anywhere, are some of the harsh realities of the life of this con artist and phony, the "great American football hero". 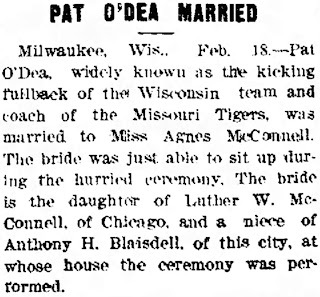 O'Dea was married twice, legally to Agnes McConnell (1880-1951), daughter of Chicago merchant Luther McConnell (1838-1907), in St Louis on February 14, 1903, and illegally (as a bigamist) to Emma Scheiffer (1878-1956) in San Francisco in 1910. O'Dea only had the one child, a daughter called Teresa Mary O'Dea, who was born to Agnes at the family home or her boat builder uncle, Anthony Houghtaling Blaisdell (1848-1905) in Coeymans, Albany, New York. Teresa later listed her date of birth as November 15, 1903, nine months and a day after her parents' wedding, to avoid any embarrassment. O'Dea's "hurried" marriage to Agnes was brought forward because of Agnes' "nervous prostration" (excessive emotional stress) brought on by finding she was already pregnant. Having converted to Catholicism to marry O'Dea - the ceremony was performed by St Xavier College Church pastor Henry Bronsgeest - Agnes was unable to stand up during the ceremony and "was just able to sit". 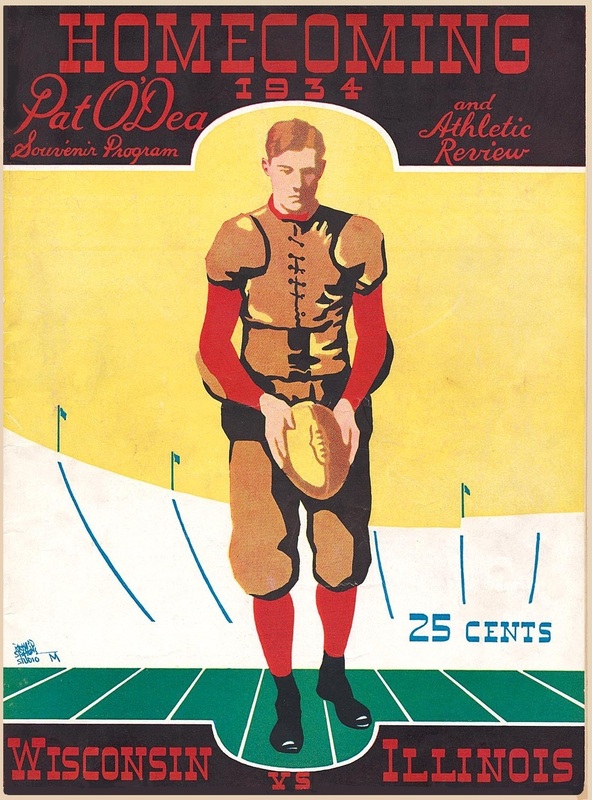 At the time of Teresa's birth, O'Dea had long since abandoned his wife and was coaching the College of Osteopathy football and track and field teams in Kirksville, Missouri. Even during his rushed trip to St Louis in February, he was more interested in talking about his track team than about his upcoming nuptials. 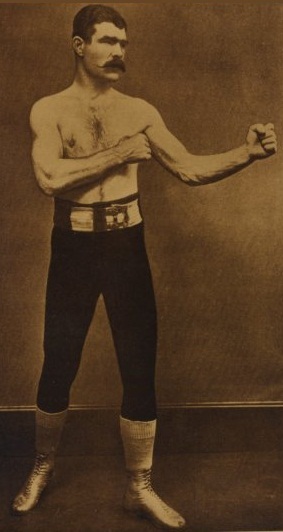 Paddy O'Dea's older brother, engineer Andrew Matthew O'Dea (1867-1936), who was a champion oarsman in Melbourne before going to England in July 1889 as a trainer for Australian heavyweight boxer Francis Patrick "Paddy" Slavin (born Vacy, New South Wales 1862; died Vancouver, Canada, 1929). Slavin and O'Dea went to the US in March 1891, but Slavin failed to come to terms for a world title fight with John Lawrence Sullivan and moved back to England. 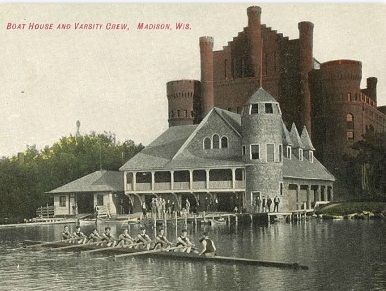 Andy O'Dea remained in the US and became a member of the Lurline (now Minneapolis) Boat Club before being lured to Madison by University of Wisconsin president Charles Kendall Adams in early 1895, to be Wisconsin's rowing coach. He later coached Harvard University. Andy O'Dea introduced the "Yarra Yarra stroke" to American intercollegiate rowing, a stroke named in honour of his former Melbourne club, which rowed on the Yarra River in the Victoria capital. 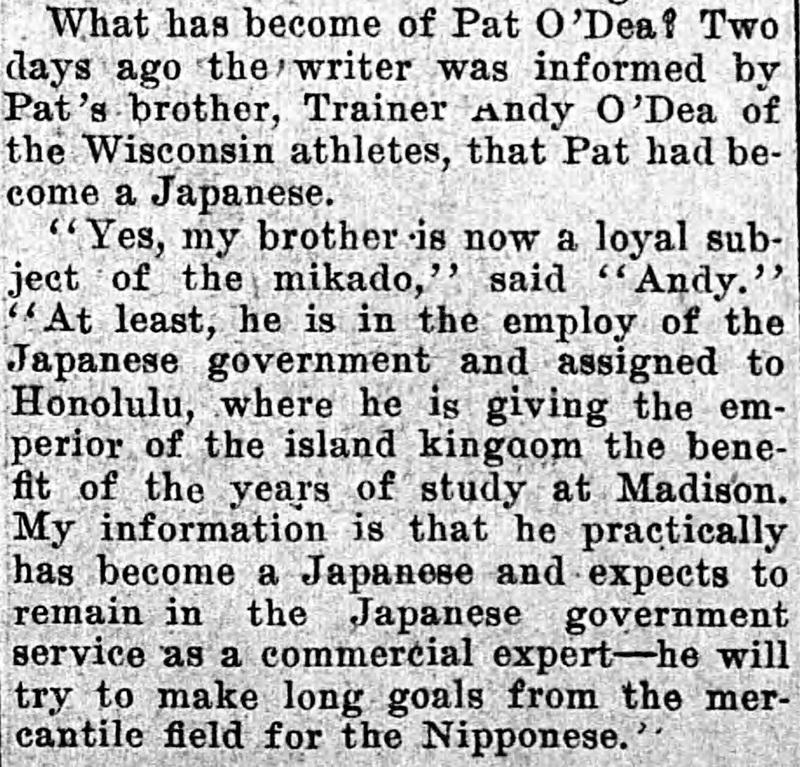 Andy O'Dea finished up working as a clerk in the credit department for the New York City sports goods company founded by Albert Goodwill Spalding in Chicago in 1876. Unlike his younger brother Paddy, Andy was essentially an honest man. Paddy and Andy O'Dea last spoke to one another in 1914, and Andy and Agnes were led to believe Paddy had died while serving with Australian troops on the Western Front in World War I. This was yet another lie that Paddy made no attempt to dispel. Instead, Paddy O'Dea was alive and well and hiding away in the forests of California under an assumed name, Charles J. Mitchell. 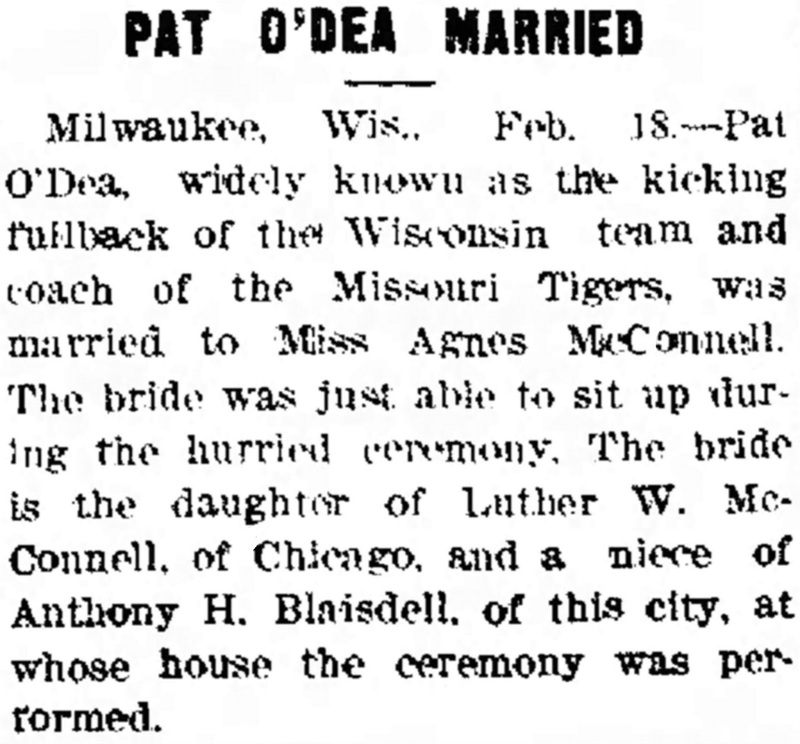 Like Jodie Hayne, Agnes O'Dea simply got on with her life. A year after O'Dea had deserted her, she won a university scholarship and entered the DeWitt County Teachers' Institute in Clinton, Illinois, becoming a teacher and moving with her daughter from her native Illinois to Salem, Massachusetts. At that point she was still registering herself as married, but, significantly, by 1920, called herself a widow. She was never divorced from O'Dea and O'Dea never became a naturalised US citizen, though he applied for US social security in March 1943. Agnes O'Dea had put Teresa into the Sacred Heart Convent in Albany, New York, while she studied for a Bachelor of Science degree in dietetics at Columbia University, Simmons College, Boston, and St Mary's College, Notre Dame, Indiana. 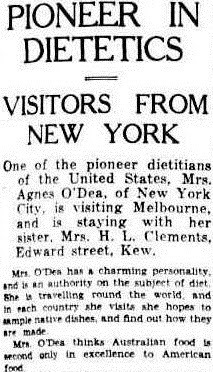 In 1919 Agnes was appointed chief dietitian at John Hopkins Hospital in Boston, a position she held until 1926, when he moved to the Fifth Avenue Hospital in New York City (which merged with the New York Medical Centre in 1938). She went on to become a consulting dietitian, an American pioneer in the field, and remained with Teresa in New York City until her death there on December 8, 1951, aged 71. Amazingly, three years after Paddy O'Dea had "re-emerged" in California in September 1934 as Paddy O'Dea, shrugging off his 17-year pretence as "Charles J.Mitchell", his wife Agnes O'Dea visited his sister, Tessa Clements, at Tessa's home on Edward Street, Kew, in Melbourne. She was diplomatically described at the time, in early March 1938, as Tessa's "sister". But when Agnes died in 1951, Tessa placed a death notice in the Argus newspaper in Melbourne and said Agnes was her "dearly loved sister-in-law". There was no mention of Tessa's brother, Paddy. 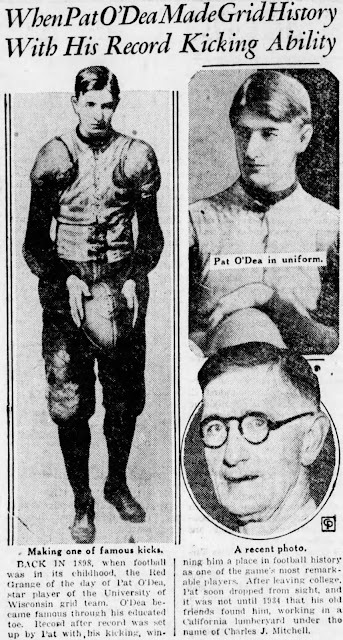 They did include O'Dea going under cover at the Red River Lumber Company yards, founded in 1913 in Paul Bunyan's hometown of Westwood, deep in the Sierra Nevada Mountains, but the most common was that he felt the fame of being Paddy O'Dea, which had followed him full force to California, had become too much for him. for a pathological liar, even as late as April 1962. 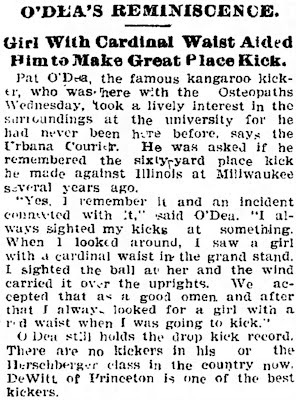 All of this was a monumental lie, as O'Dea clearly relished the limelight and hated being out of the newspapers as the "Kangaroo Kicker" from Wisconsin. Living the lie: A shifty Paddy O'Dea is met at Chicago on November 16, 1934, on his way back to the Madison campus. His two friends seen here are Dr Joseph Dean, who played end with O'Dea in 1897, and George F. Downer, a member of the track team of the same year. 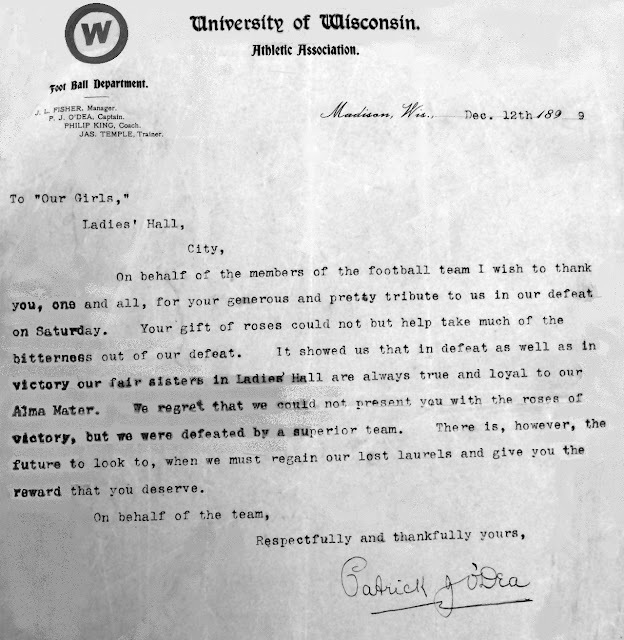 Regardless of his charade, he was welcomed back to Madison, Wisconsin, with open arms, royally feted, honoured and ultimately, as he lay dying of cancer in the University of California Medical Centre, Room 912, in early April 1962, made a college football Hall of Famer and recipient of 90th birthday best wishes in a letter from President John F. Kennedy "As a fellow son of Erin and a longtime admirer ...". O'Dea's many misdemeanours, especially those in relation to abandoning his wife and daughter, were all completely forgotten - except by members of his own family, notably Andy and Tessa. The year before he died, at the age of 89, he was "reconciled" with Teresa, who he met in Idaho. By that time Teresa was a grandmother of 10 and was remarried, to a man called Tom Ireland of New York. In 1923, aged 20, Teresa had married Jordan Wheat Lambert II (1901-79), and they had three children, Jordan Wheat Lambert III (1924-1995), Barbara (1926-) and Andrew Alexander Lambert (1929-2007). She had lived most of her married life in Stamford, Connecticut. The lies O'Dea had told when he came out of hiding in Westwood included that his pseudonym of Mitchell was his mother's maiden name. It wasn't. His mother was a Crossley, as Melbourne newspapers were quick to point out. Instead, the name of Mitchell came from neighbours O'Dea had grown up with in Richmond, Melbourne. This family had a daughter, Helen Porter Mitchell, almost 11 years older than O'Dea. 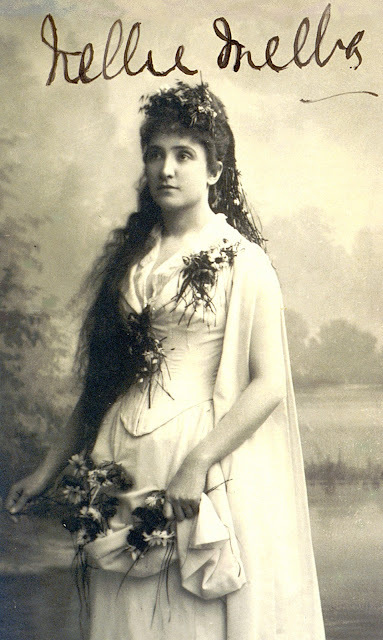 Helen left Australia in 1886 and became famous as Dame Nellie Melba. It is true that on January 11, 1899, Melba appeared at the Metropolitan Opera House on Broadway in New York City as Marguerite in Faust. She had made her American debut in 1893 at the World's Fair Opera House, Chicago, and from that time onwards spent many winters starring at the Met. But it's questionable whether she was in Chicago in February 1899. 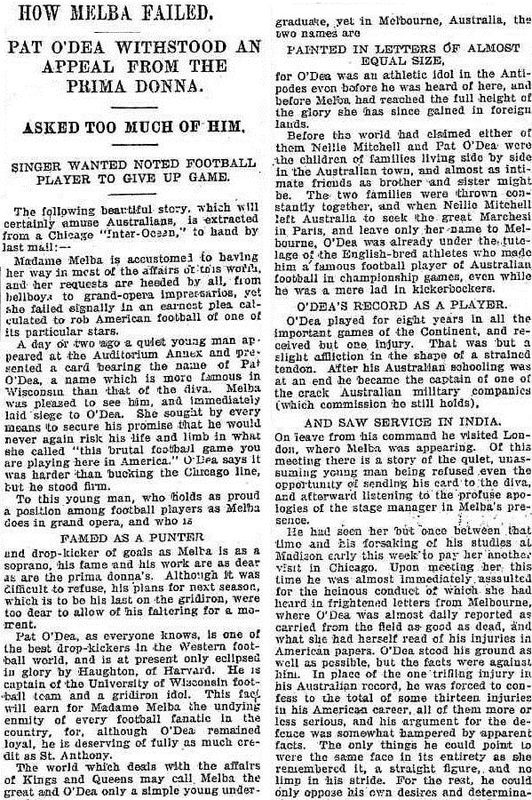 Regardless of the truth of O'Dea's supposed meeting with Melba, and her efforts to convince him to give up football, this article clearly reveals the "Walter Mitty" in O'Dea. For one thing, he never saw service in India, and he was never an officer in a "crack" Australian military company. And he never visited London. He had arrived in the US from Australia through Vancouver, Canada, in March 1896. 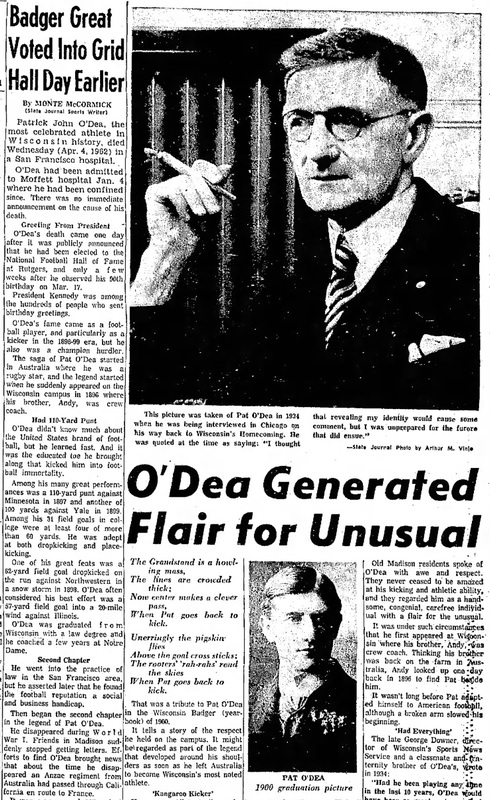 As much as O'Dea might have been thrilled to read this story about himself, which appeared both in the US and Australia, it exposed him as the compulsive liar he was throughout his life. And throughout his life, O'Dea even lied about his own date of birth. Being, as President Kennedy called him, "a son of Erin", he wanted everyone to believe he was born on St Patrick's Day. 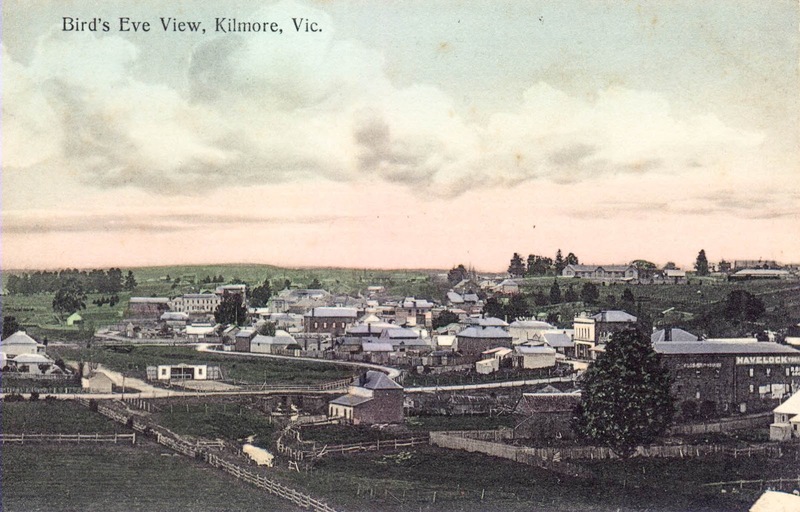 In fact, he was born on March 16, 1872, in Kilmore in Victoria. His hometown itself is given to bending the truth: it has contentiously claimed to be Victoria's oldest inland settled town. 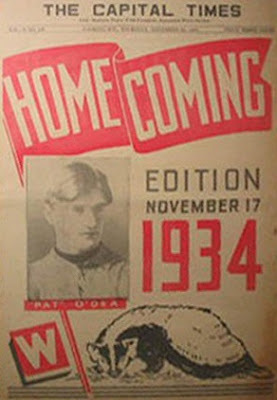 After his family moved to Melbourne, Paddy was educated at Christian Brothers' School, St Kilda, and Xavier College, Kew. The year he moved on to Xavier, 1888, O'Dea was awarded a bronze medallion by the Royal Humane Society of Australasia for recovering a drowned woman, Annie Crooke, from the sea at Mordialloc. 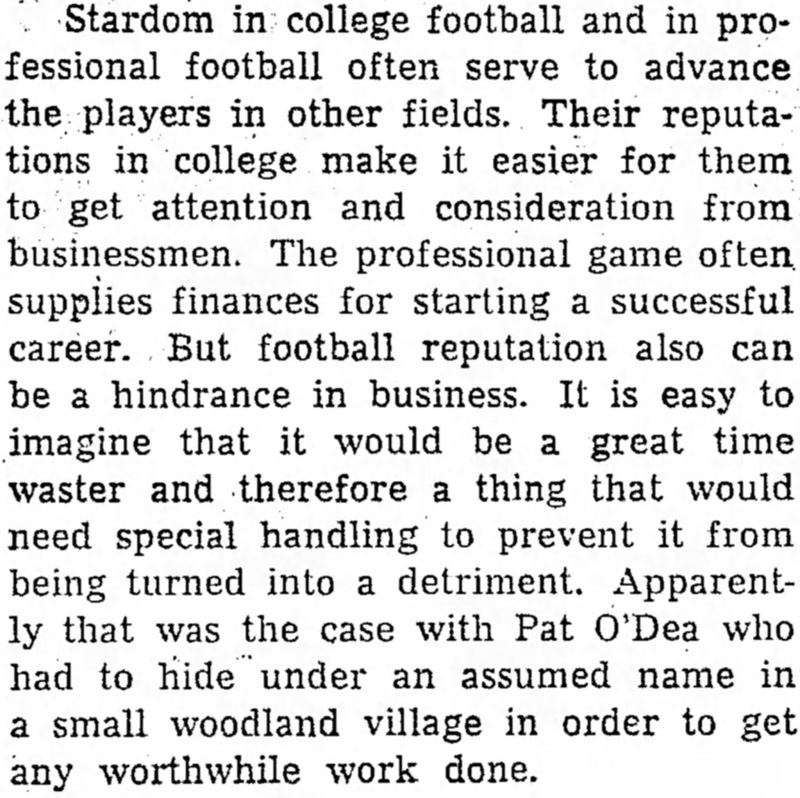 As was his want in most matters, O'Dea later embellished this story to include sharks. The only known shark attack at Mordialloc occurred on December 1, 1936, almost 50 years later. [Oddly enough, more than eight years after the Mordialloc "rescue" - O'Dea was to claim he had saved the women's life - O'Dea performed very similar heroics after a rowing accident on Lake Mendota in Wisconsin]. 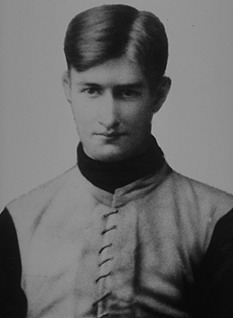 O'Dea played Australian football for North Melbourne, Melbourne (on a wing when they were competition runners-up in 1894) and finally made his debut for Essendon against Fitzroy at East Melbourne in June 1895. 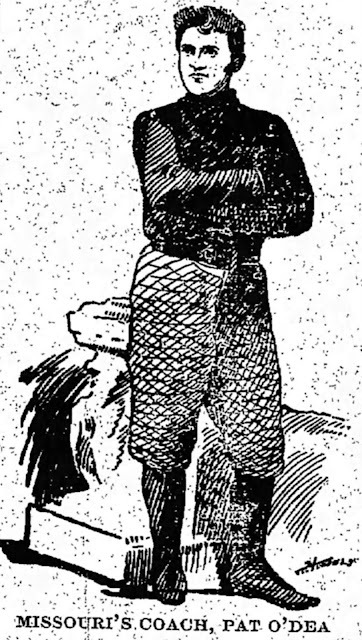 O'Dea also represented Victoria against South Australia in 1894. 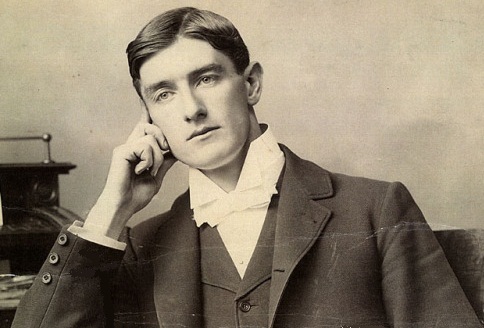 Among his footballing contemporaries were Albert Thurgood, Peter Burns, Jack Worrall and Test cricketer Harry Graham. 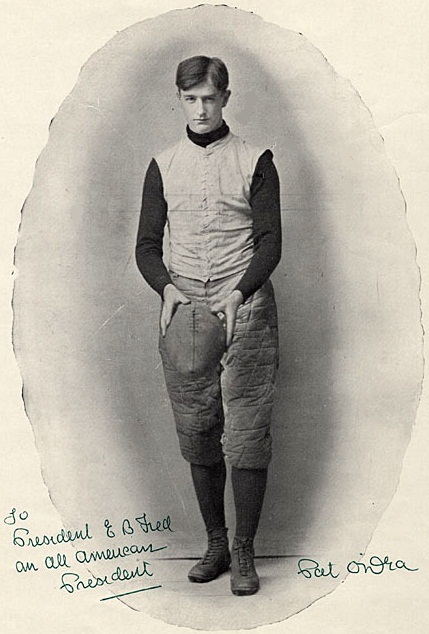 Critics rated O'Dea a long kicker, though "not as good as Jasper Jones of Carlton" [William Fagg Jones, born in Nhill, Victoria, in 1863, died in 1947]. Away from sport, another of O'Dea's contemporaries was the art critic and gallery director James Stuart MacDonald (1878-1952). In 1934 Jimmy McDonald recalled that O'Dea was to have been articled to his father, Hector MacDonald, to become a solicitor, but failed to matriculate. 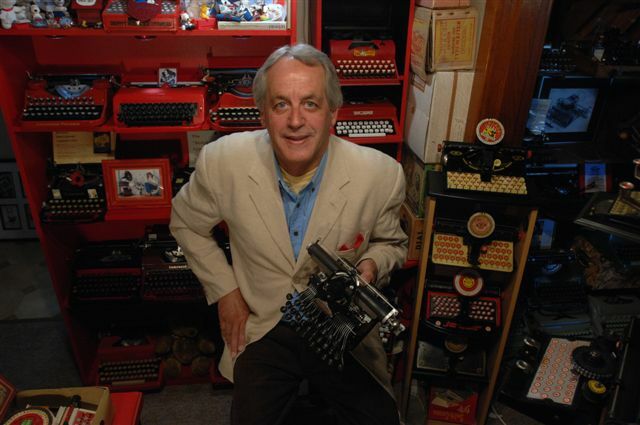 "He played jokes and games instead," said Jimmy. 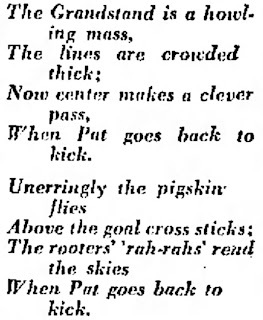 "Paddy O'Dea could take high marks [in football] but couldn't get the kind to enable him to pass exams." 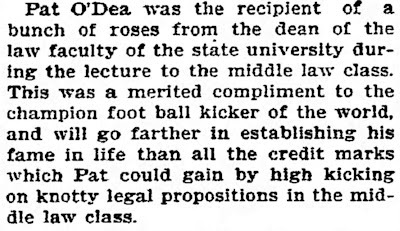 MacDonald went on to suggest that O'Dea's football prowess had enabled him to resume studying law in Madison and to "graduate in record time" in 1900. MacDonald's recollections match an observation Dave Revsine makes in his book The Opening Kickoff: The Tumultuous Birth of a Football Nation, the only published work that tells the truth about O'Dea. 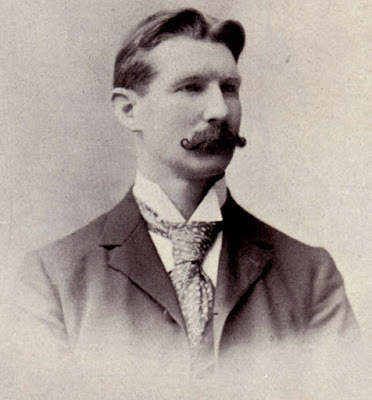 Revsine says that in 1889 O'Dea applied three times to study at Melbourne University and was rejected each time. 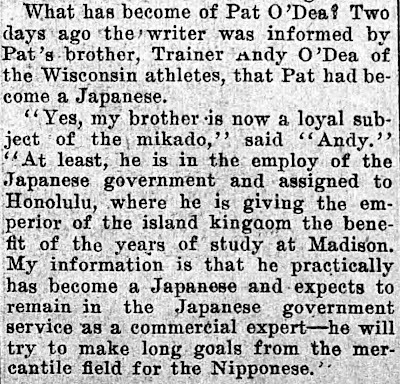 O'Dea's failure to advance his ambitions to be a lawyer in Australia make his later claims, that he visited his brother Andy in Madison, Wisconsin, en route to Oxford University in England, yet another classic and outrageous example of O'Dea's total disregard for facts. club in Brisbane and later in Sydney. O'Dea left Wisconsin in 1900 to coach football at Notre Dame and later the Osteopathic College in Kirksville, and from 1913 football, rowing and athletics at Stanford University, California. 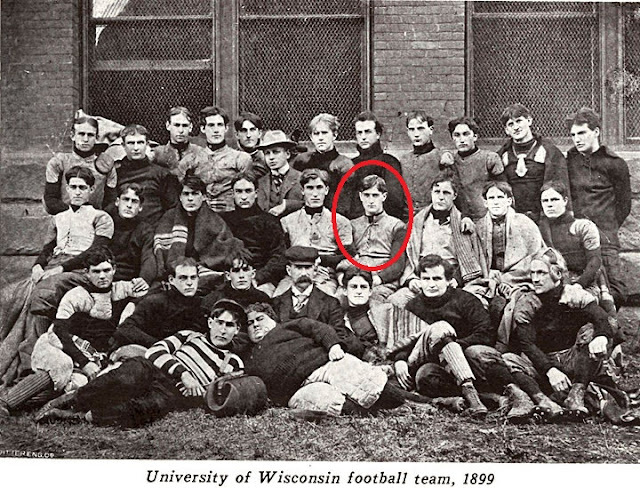 O'Dea began to tarnish his reputation at Wisconsin when he was "ruled off for slugging" [sent off for fighting?] against Michigan in December 1899. A week later he declared his intention to "retire", though he qualified for another season leading the Wisconsin team. Soon after he was talking about returning to Australia and enlisting for the Boer War - something he never did, of course. O'Dea started to lose his Midas touch after leaving Madison. 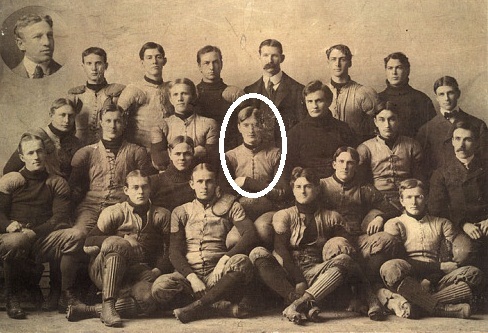 At Notre Dame and at Kirksville he was accused of throwing matches. 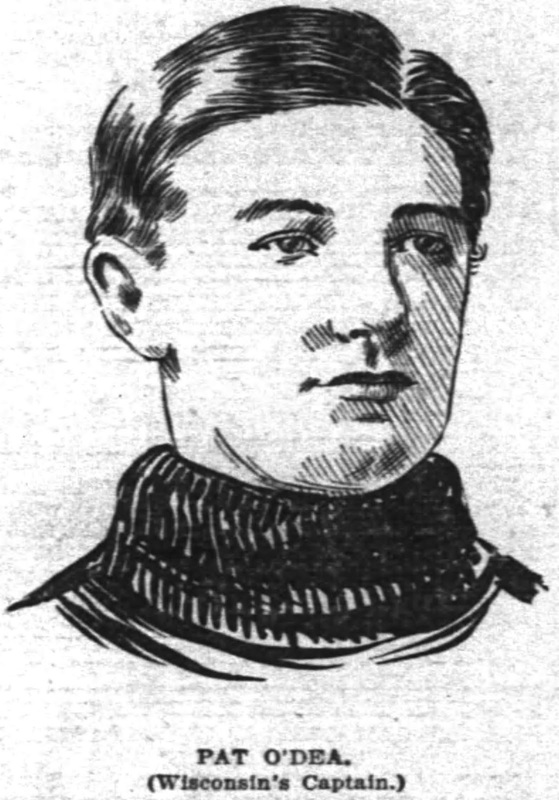 In Chicago for a match between the Yale Law School and the Western Universities All-Stars in early December 1901, he was badly beaten by "footpads" [muggers] in Chicago, suffering a broken cheekbone. While still recovering from this attack, at McCoy's Hotel on January 4, 1902, O'Dea almost died after falling into a bath of boiling water. He eventually recovered in the Alexian Brothers' Hospital. Only a fraction of these claims was true: Paddy O'Dea DID NOT tour India and the Holy Land, nor did he serve in the Boer War. 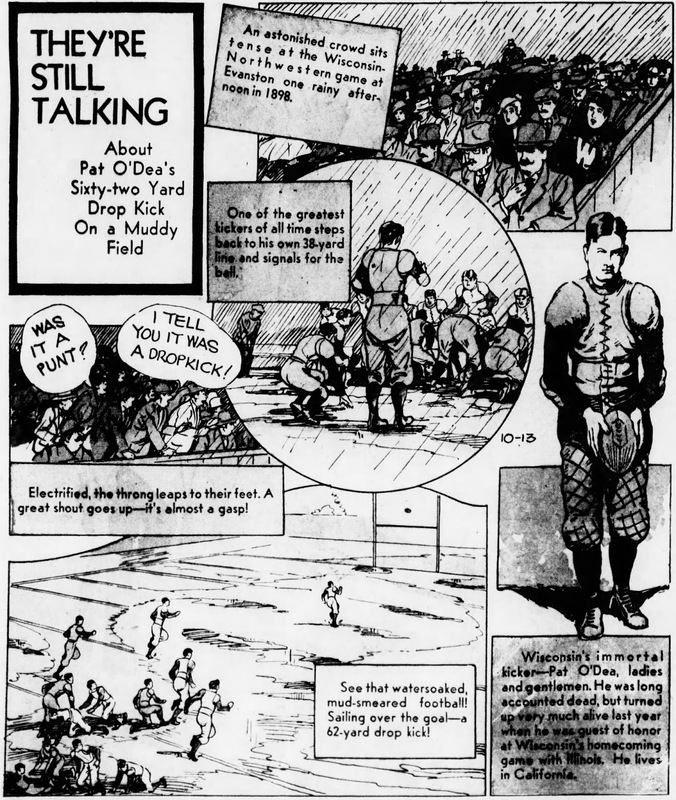 After moving to California, O'Dea did apparently practise law, briefly, as well as coach and referee football at Almeda and Lowell High School and enter into talks with John Joseph Simons about bringing an Australian schools football team to California, or taking an American team to Australia. In November 1908 he was mugged again and turned up in court drunk. 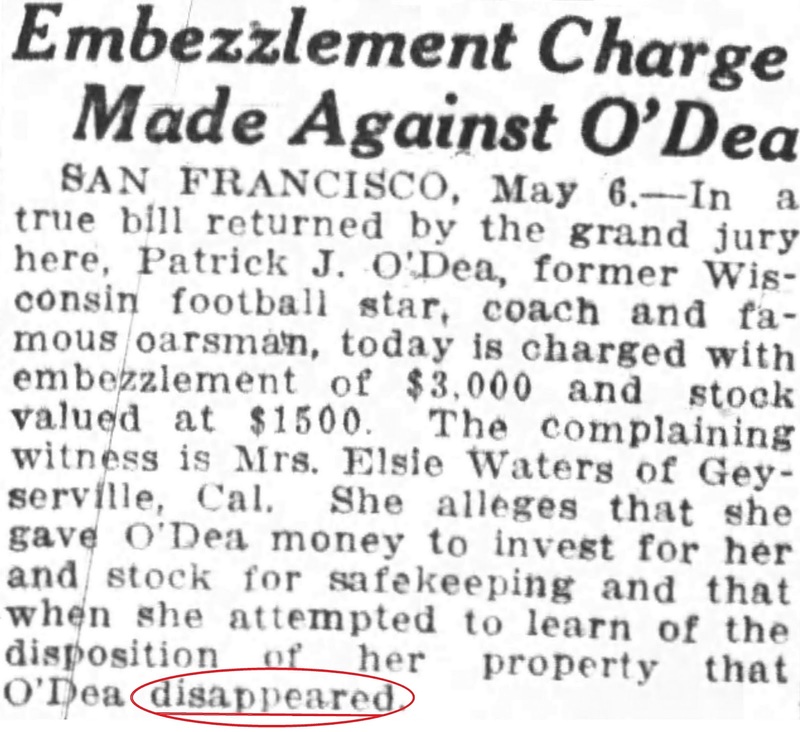 In 1918 O'Dea, claiming to have been born in 1877, registered as an "alien" in the US World War I draft in San Jose, giving his occupation as sales manager for a prune and apricot growing concern and declaring "Mrs Emma O'Dea" as his wife. 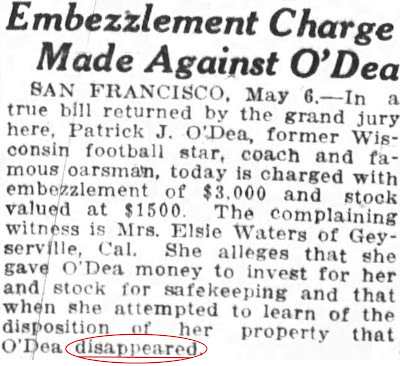 In 1919 came the embezzlement accusations, as well as gambling debts, and in 1920 O'Dea attempted suicide by hanging himself from the rafters of his home. 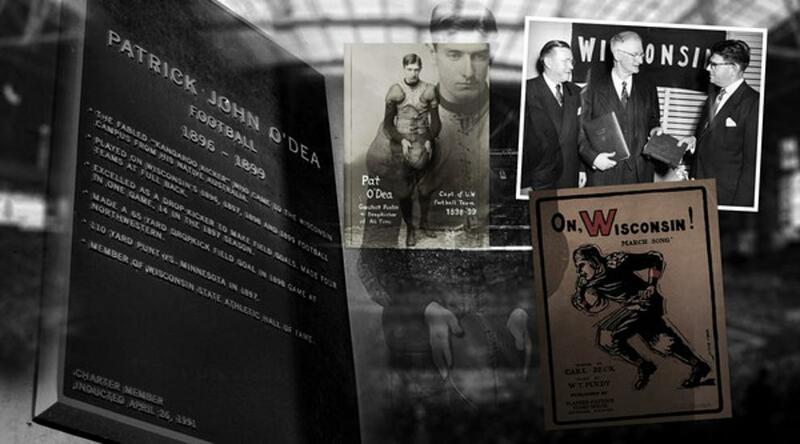 O'Dea died on April 4, 1962. Oddly enough, while his social security application in 1943 had listed his mother's maiden name correctly as Crossley, his death certificate listed his mother's maiden name as Mitchell - one last lie to end it all! *Marmion Percy "Storky" Greenwood-Adams (1881-1965), a "circus journalist" no less, was the clown who fed American columnists, notably Arthur Daley of The New York Times, with most of the nonsense about O'Dea's Australian days which appeared in US newspapers in the second half of the 20th Century. 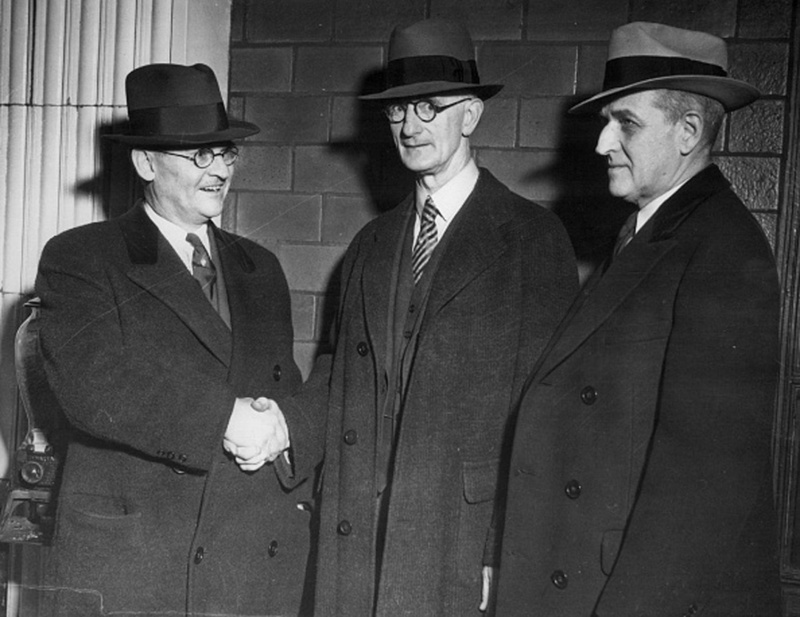 Fated to be feted: Paddy O’Dea, centre, with Tony O’Brien and J.A. 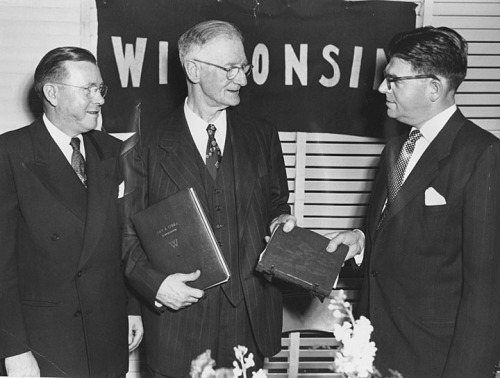 Skogstrom in 1951. We love you more and more. And always kicks a goal or two. 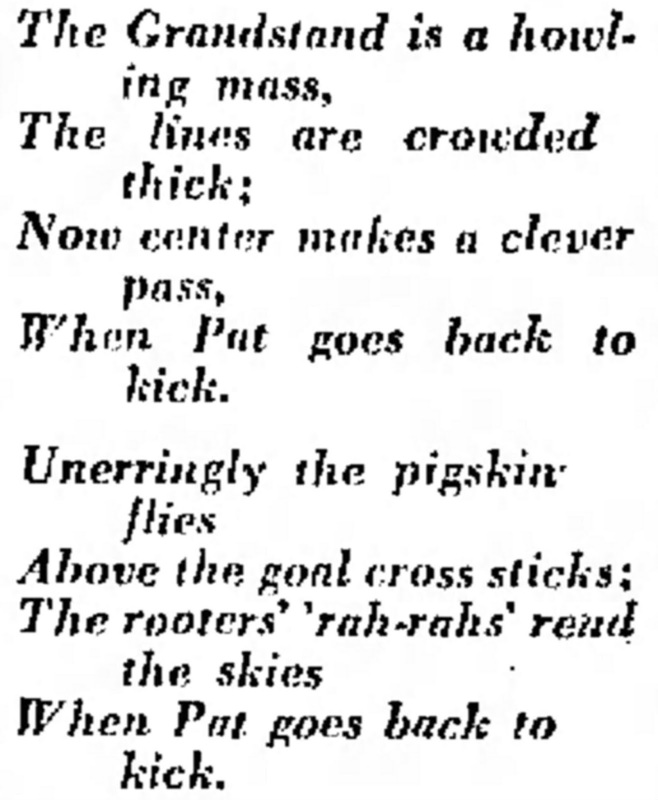 The team and rooters worship you. To this brave lad forever we shall proudly sing. He is the boy we love. There is no other lad to see like Pat O’Dea. For he’s the only boy in all this land so free.